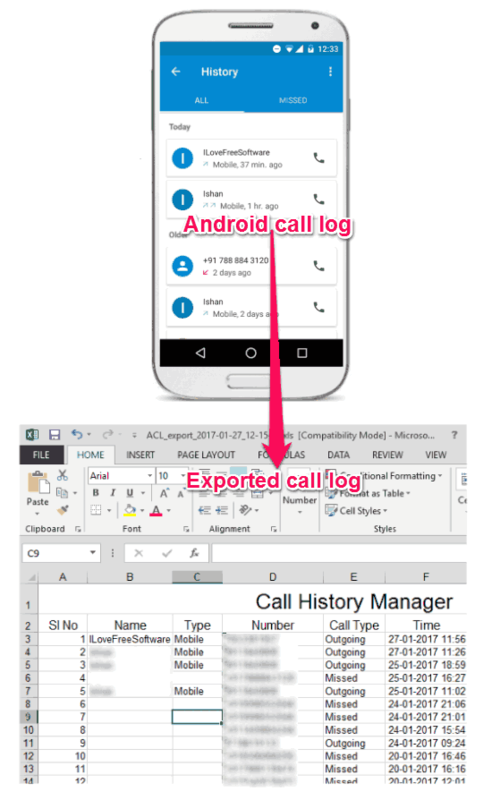 This tutorial explains how to export Android call log to Excel. For this, I will use a free Android app called Call History Manager. It is a free Android app that lets you export Incoming, Outgoing, and Missed calls log to an Excel (XLS) file. The final Excel file shows the name of the contact, phone number, duration, type of call, and duration in seconds. And after exporting the Excel file, you can also share it via Bluetooth, Email, Google Drive, etc. Exporting call log to excel file can be useful in case if you want to switch to a new phone or format the existing one, or any other reason. We have already covered how to log Android call log in How to Log Android Phone Calls to Google Sheets. But that method is for Live logging of calls, and not one time export of the call log. In such cases this Android app can come in handy. Using this free Android app, you can easily export the call log to an Excel file. Also, this app includes all the necessary information in the Excel file. And you can also use it to perform other tasks as well, such as creation of fake call logs. It can also show the graphical stats of the call history in its Statistics section. Let’s see how to export Android call log to Excel. How to Export Android Call Log to Excel? Call History Manager is a very easy to use app. It has an intuitive interface and you can easily use it to export Android call log to Excel. Follow these simple steps to do the same using Call History Manager. Step 1: Download and install Call History Manager app from here. When you open it after installing, you will find its interface very much similar to Android’s built-in Call log app. 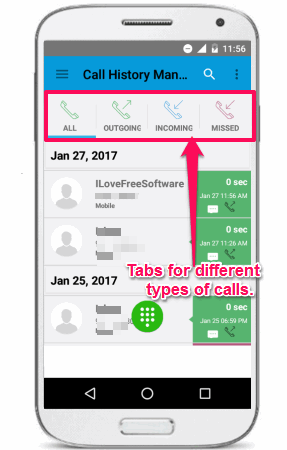 It shows All, Missed, Incoming, and Outgoing calls in separate tabs with various stats. You can see the below screenshot. Step 2: Now, what you have to do is choose the tab whose log you want to export. If you want to export call log of all the calls, then navigate to All sections and find the Export to excel option from the options menu at the top right of its interface. Similarly, you can choose to export call log of Missed Calls, Outgoing Calls, or Incoming Calls. Step 3: Tap on Export to excel option and you will see a message will be displayed on the screen that the Excel file has been exported. From the same message dialog, it provides the option to directly share the generated file via mail, Bluetooth, Google Drive, etc. As I mentioned earlier, the exported call log in Excel includes information like, name of the caller, Phone Number, Call type, Time, duration of call, etc. 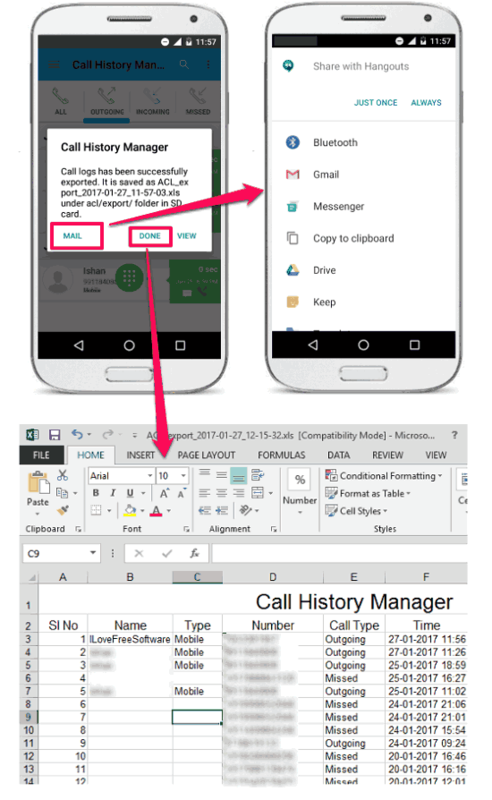 So, in this way you can easily export Android call to Excel using Call History Manager app. The output file has the XLS format and show all the necessary stats in it. And what I really like about his app is that you can also export call log of other types of calls (Missed, outgoing, etc.) individually. Apart from Exporting Android call log to Excel, this app can perform various other tasks also. It can also create fake call logs, Edit contact or send message to it from the call history directly, backup-restore the call history, etc. However, it shows some annoying ads on its interface when you are connected to the internet. For an ad free version of the app, you will have to purchase it. Call History Manger is a very nice app that can export Android call log to Excel. 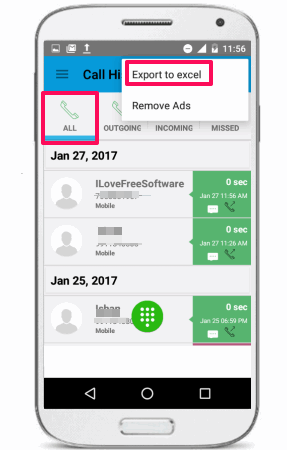 Though, there are already some apps out there that can do the same, but most of them are paid or not as smarter as Call History Manger. And it can also export the log of missed, outgoing calls individually, this is what that makes it a good pick among its kind. So, if you are looking for the same, then this would be a good choice.